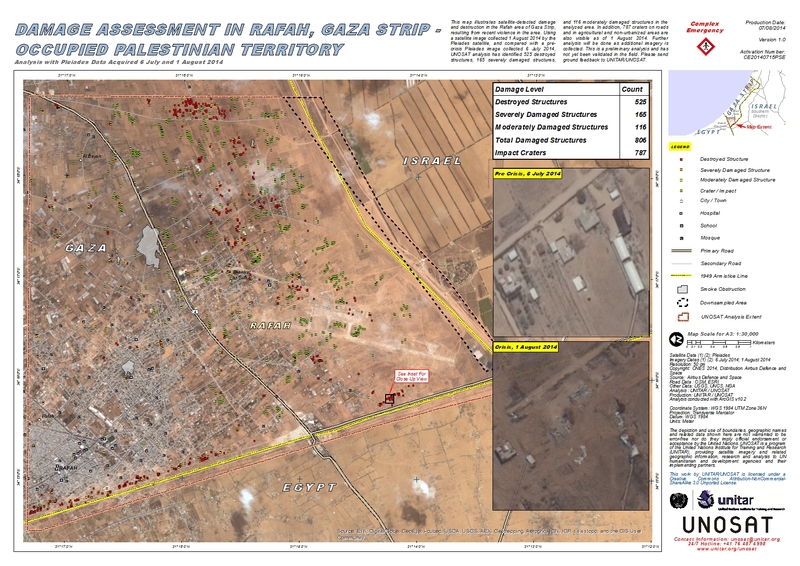 This map illustrates satellite-detected damage and destruction in the Rafah area of Gaza Strip, resulting from recent violence in the area. Using a satellite image collected 1 August 2014 by the Pleiades satellite, and compared with a pre-crisis Pleiades image collected 6 July 2014, UNOSAT analysis has identified 525 destroyed structures, 165 severely damaged structures, and 116 moderately damaged structures in the analyzed area. In addition, 787 craters on roads and in agricultural and non-urbanized areas are also visible as of 1 August 2014. Further analysis will be done as additional imagery is collected. This is a preliminary analysis and has not yet been validated in the field. Please send ground feedback to UNITAR/UNOSAT.